San Diego, CA (January 12, 2015) – Chris and Rebekah Pierce of Pulaski County are leaving the American Farm Bureau Federation’s (AFBF) 96th annual convention with one of the organization’s top honors – the Young Farmer & Rancher “Achievement Award.” This award recognizes young farmers and ranchers who have excelled in their farming or ranching operations and exhibited superior leadership abilities. Participants are evaluated on a combination of their agricultural operation’s growth and financial progress, Farm Bureau leadership and leadership outside of Farm Bureau. Chris and Rebekah Pierce of Pulaski County (left) received the Young Farmer & Rancher Achievement Award at the American Farm Bureau Federation’s 96th annual convention, held in San Diego, CA. 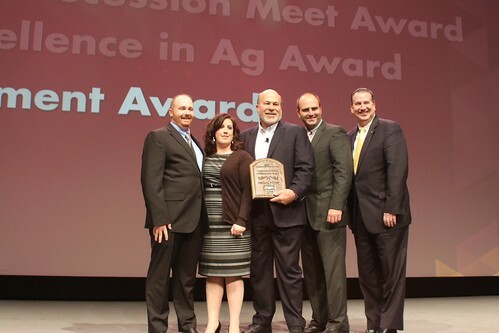 The award was presented by Bob Stallman, AFBF President (center), and representatives from General Motors (right). The Pierces, who were also winners of Kentucky Farm Bureau’s (KFB) 2014 “Outstanding Young Farm Family” award, grow row crops on a 3,441-acre farm in Pulaski County. Last year they produced more than 1,550 acres of corn, 900 acres of soybeans, 800 acres of wheat and 100 acres of canola. They also had nearly 700 acres of cover crops as part of the National Soil Health Movement. In addition to farming, Chris and Rebekah are both active members of the KFB Young Farmer program. Chris is also a graduate of KFB’s Leadership Enhancement for Agricultural Development (LEAD) class, has an off-farm job teaching young farmer classes at a community college, has served on several of KFB’s state advisory committees and is in a leadership role in numerous other ag-focused organizations across the state. As the winners of this national competition, Chris and Rebekah were presented with their choice of either a 2015 Chevrolet Silverado or a 2015 GMC Sierra, courtesy of GM, and a paid registration to AFBF’s 2015 FUSION (Farmers United: Skills, Inspiration, Outreach and Networking) Conference held February 13-16 in Nashville, Tennessee. “We feel passionate about helping other young farmers in our community and providing educational leadership opportunities in our community to help other people,” said Chris. For additional information about the 96th American Farm Bureau Federation annual convention, held in San Diego, California, visit annualconvention.fb.org.